Bella Negra .... just as the name implies. Beauty in black. Bella belongs to a client (family client who bought her at the Peruvian Classic sale!) Bella is from a wonderful BEIGE dam with Stachowski alpacas Chaval and Channing in her background. Her fiber is soft, dense and CRIMPY!!! WOW Crimpy .. that's how I describe it. It is a medium frequency, high amplitude waves from the skin to the tip. She has amazing glossy brightness, like looking at a shiney piece of black coal. Her fiber is also VERY healthy, unbelieveably consistent and well conditioned. She also has those fluffy little ears that make the alpaca look so animated. Her coverage is completely to the ground and around her toes. Her head has a short muzzle and fiber galore! Neither parent lacks fleece coverage, and neither lacks softness or crimp either. She has great substance of bone -- large strong legs and feet. Take no chances with this gal, she is quality from top to bottom! Axtion Jaxon has come to the Promised Land! Axtion Jaxon has never before been available for breedings outside of Colorado! We have purchased a half interest in this amazing male! He has maintained his exceptional fineness and lack of medulation well into his later life and he consistently passes on these characteristics to his offspring along with his pitch black coloration. Axtion Jaxon is a Non-Fading True Black who won GET OF SIRE at the Mid America Show 11-05 competing against two strong whites. This is a rare winning for a black. AJ DOES add value and marketability to his cria's and they certainly will for yours. He is a predictable color breeder. The lightest color he has produced is light brown. Bring on the white and fawn females! He'll give you color. You want females? Most of his offspring are females! He is able to pass on color, fineness, very little medulation and tight crimp. He's been known to eliminate fiber imperfections in just ONE generation! Fleetwood is a Full Peruvian, non-fading, jet black male. Full coverage from the helmet head down his tree trunk legs, with fiber spreading over the toes. Fiber has a buttery hand, extremely bright radiance, and gorgeous character. No guard hair in the prime blanket, even now at 4 years old, he does NOT carry guard hair in the prime blanket area and this is so unusual for a true black. Not one white fiber can be found ANYWHERE on this macho. His sire is the incredible, Axion Jaxon, son of the finest black import to enter our country, CPeruvian Jaxon. AJ has produced MANY a champion in black, and is actually what we consider the TOP black, full Peruvian male in our country. Fine No guard hair, not a doubt, crimpy - wonderfully crimpy for an older male, coverage, bone, everything we could ask for to compliment Bella Negra, Fleetwoods dam. Bella Negra is Fleetwoods dam, and she is the daughter of the late, great Socosani from Vintage Alpacas. Coming from grey and having no other colors in her fleece, Bella carries both dominant and recessive BLACK color genes. AJ also carries both dominant and recessive true black color genes. For those of you looking to cover a pattern, this is the combination you need. Neither parent contributed a pattern gene, so Fleetwood therefore can only contribute genes for solid pattern and black color. Your chances of covering the pattern are nearly 100%. Your chances at black are also nearly 100%. 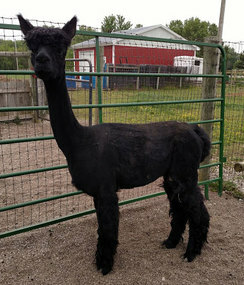 Fleetwood is a specific male, bred for a specific use: cover pattern with black fleece cria. 100% crias are solid and black! We decided to co-own Fleetwood Black with Vintage Alpacas for these very reasons. 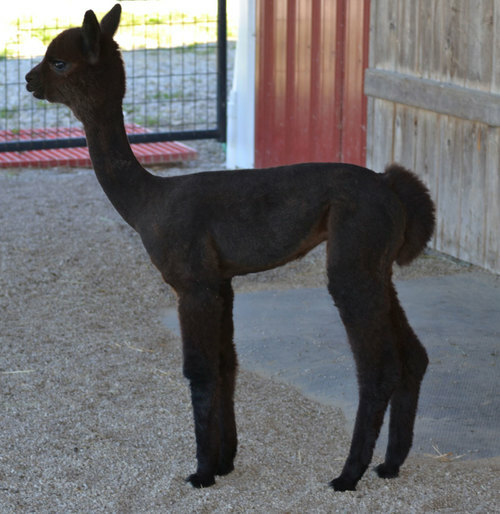 We had a cria, OLWA Stevie Nix, from our white faced girl, OLWA Iriss and they produced a solid bay black cria. This is what Fleetwood is all about. Proudly co-owned with Vintage Alpacas. 3rd - Full Fleece, Michigan International Alpaca Fest (combined bay and true group and Fleetwood was the highest placing TB). 2nd - Full Fleece, Ohio National Champions Show (combined true and bay black), December 2009.